Description: 1970 introduced 3 new Little People sets that were designed as accessories for the #952 Play Family House. These sets were the #726 Patio Set, #728 Decorator Set and the #729 Kitchen set. The Patio set was the first to introduce an umbrella table, swimming pool, and BBQ grill. The BBQ grill was used in many other sets for years to come. The umbrella table with a flowered imprint and the swimming pool with a toy imprint inside were used on only one other set, 1972's #909 Play Family Rooms. FPT219 - Turquoise (Blue) table features a YELLOW umbrella mounted by a spring-pole. The umbrella has turquoise and orange flower designs on top. 2 each - FPT149 - Small yellow plastic single-seat captain chair that has a seat back that extends 3/4 of the way around the seat with a DOT mark on back. Click here to see the difference between triangle back verses dot back chairs. Click here for a photo that shows the difference between yellow, Mustard yellow, and gold/butterscotch yellow. *See "Variations" below. 2 each - FPT143 - Small orange plastic single-seat captain chair that has a seat back that extends 3/4 of the way around the seat with a DOT mark on back. Click here to see the difference between triangle back verses dot back chairs. FPT25 - Round turquoise swimming pool with an engraved design on the bottom of the pool. The design has yellow and orange toys, such as a beachball, sailboat, and sand shovel. FPT133 - Round yellow plastic "backyard BBQ" style grill with SEPARATE SPINDLE (STRAIGHT) LEGS. Has a lithograph on top of a steak, hamburger, and a hot dog. Has a small plastic handle off to one side. FNWW - Blue mom with fancy eyes, and a blonde ponytail. 2 each - FPT139 - Small gold/butterscotch yellow plastic single-seat captain chair that has a seat back that extends 3/4 of the way around the seat with a DOT mark on back. Click here to see the difference between triangle back verses dot back chairs. Click here for a photo that shows the difference between yellow, Mustard yellow, and gold/butterscotch yellow. *See "Variations" below. FPT220 - Yellow table features a TURQUOISE umbrella mounted by a spring-pole. The umbrella has yellow and orange flower designs on top. 2 each - FPT149 - Small yellow plastic single-seat captain chair that has a seat back that extends 3/4 of the way around the seat with a DOT mark on back. Click here to see the difference between triangle back verses dot back chairs. Click here for a photo that shows the difference between yellow, Mustard yellow, and gold/butterscotch yellow. FPT27 - Round yellow swimming pool with an engraved design on the bottom of the pool. The design has turquoise and orange toys, such as a beachball, sailboat, and sand shovel. FPT131 - Round turquoise plastic "backyard BBQ" style grill with SEPARATE SPINDLE (STRAIGHT) LEGS. Has a lithograph on top of a steak, hamburger, and a hot dog. Has a small plastic handle off to one side. FNWW or FNWP - Blue mom with fancy eyes, and a blonde ponytail. FPT219 - Turquoise table features a YELLOW umbrella mounted by a spring-pole. The umbrella has turquoise and orange flower designs on top. FPT139 - Small gold/butterscotch yellow plastic single-seat captain chair that has a DOT mark on back. FPT20095 - Small mustard yellow plastic single-seat captain chair that has a DOT mark on back. 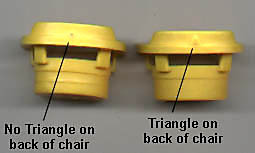 FPT149 - Small yellow plastic single-seat captain chair that has a DOT mark on back. This set was sold on a 13" x 11" blister pack, 4-color display card.